Belated Christmas wishes to everyone here, I trust you spent the time well. Anyone who has yet to travel I hope you’ll complete it safely. Depending on where you are in the world your holiday observances may be continuing today. I know our readers in the UK, Canada, Australia and New Zealand are on Boxing Day today. Others know December 26th as St. Stephen’s Day, or simply the second day of Christmas. About this time of year I get asked whether Amish give gifts for Christmas. The day may have passed, but for future reference, Amish do give gifts, though as you’d expect they are simpler than what English children receive. Toys and books may be given as presents; see this post on Amish Christmas gift-giving, or this one on good presents for Amish friends for examples (bookmark for next year if you have Amish friends on your list). 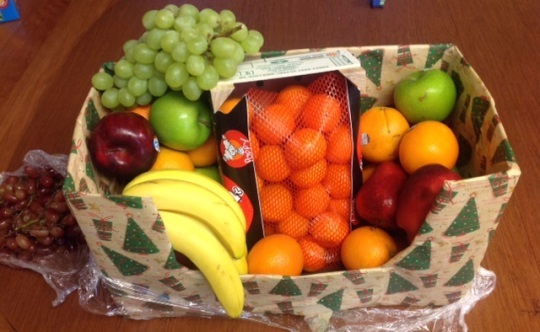 That is a serious fruit basket. Healthy. 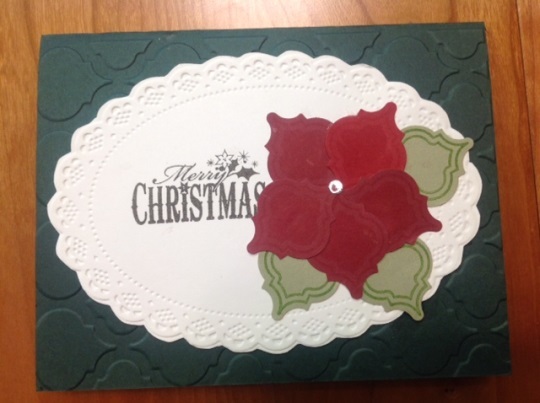 Last year we looked at Amish Christmas card customs. Amish do send Christmas cards to one another. You often see them hanging in Amish homes. I bring this up after the fact, because my cards have yet to go out. A plain and simple Christmas is what I like best. Homemade instead of purchased items have far more meaning for me. Just a great way of remembering the reason for the day. I agree Robert. One year my mother gave coupons for home cooked meal, a night of baby sitting, etc. It was well received. This year my children gave me the gift of time. Time with them to sit and remember, laugh and enjoy each other. That was perfect. 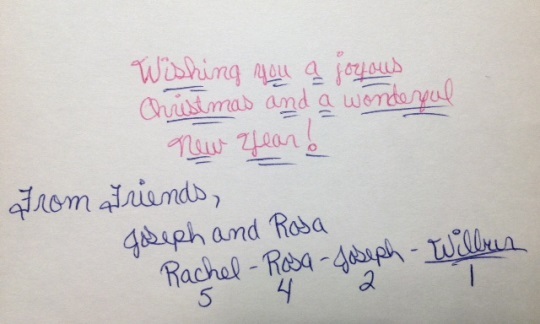 I always send a card and letter (printed on our computer) to two women, now living in Indiana, who used to clean my mother’s house. (“If they hadn’t moved, I would still be living in my own house, ” she said, when she was 90 and about to move in with us.) I always get cards and letters in return. The daughter’s is printed and sometimes her card is a family photo. The mother’s card is hand-made and she writes her letters individually and in longhand. We love receiving their cards and letters. My plan ran into a little snag as the main Amish settlement I went to (Pawnee City Nebraska) had gotten some 5″ of snow late Saturday, and I was there Monday morning. The main streets were fine, but the back roads were iffy and half of the Amish drive-ways were too much for my car to get through. At my first place I tried to drive up the drive but after a few times of doing it I realized it was useless. My option, walking a block through the snow and bitter cold temperatures or not give them the items. I walked it. A short visit there and off I went to 3 other Amish homes. Luckily each of the 3 saw me pulling up (or trying to) and came out and I gave them their goodies through the car window. I was happy to have been able to give out the goodies but because of the snow missed having time to sit and chat with them for a bit. Wow, that is Santa-level of commitment…sounds like great fun. Rushsylvania. 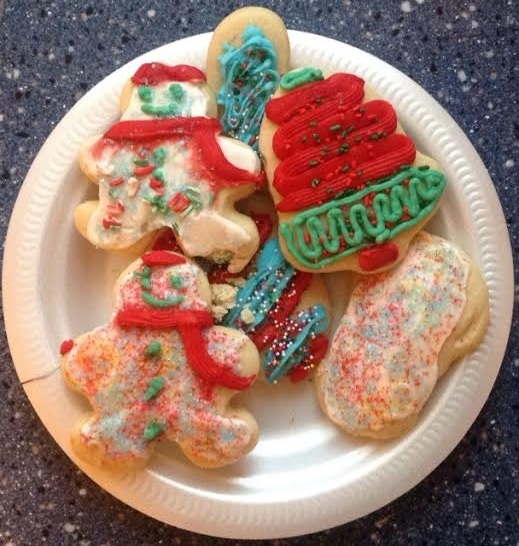 Some years they take plates of Christmas cookies with them to give to the families. As usual, there was a group that stopped at my house. Mark was with the group and, of course, Fritzi recognizes him and sat at his feet the whole time they caroled. I wasn’t too keen on Mark going caroling this year. Tuesday evening when they went it was 4 above zero. That’s pretty nippy for a 61 year old to be out caroling. But, Mark just said that he was still young and tough and went anyway. What’s a dad to do? Yesterday, we were invited to an Amish family’s get together. It was a full day affair. Breakfast was at 9:30. Mark went for that via horse and buggy but I didn’t. I don’t know what they did during the day but they had another meal at 4:00 which I went to. It was a soup supper. Good soup and plenty of other goodies. I left around 5:00 but Mark stayed on after I left. A very pleasant day. I’d have loved to have seen/heard them caroling! (We rarely have carolers out here in the suburbs!) What a wonderful gift that was for all who enjoyed their visits! Those all sound like Christmas gifts/times to fondly remember. Tom, good for you, trying to fight the snow to make your “special” deliveries (would a horse and sleigh have been more successful, I wonder?) 😉 I hope you have time to visit and chat with those friends soon. 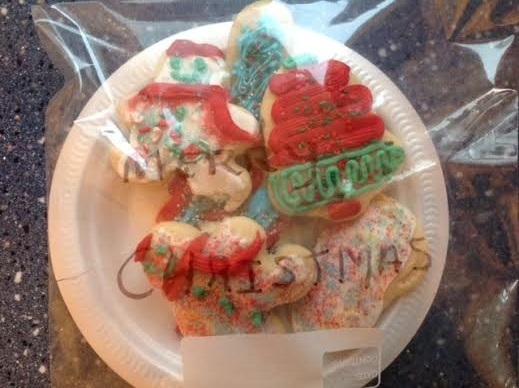 I enjoyed the photos of the home made cards…and cookies. In fact, I’m inspired to open up those treats I mentioned for a mid-morning snack! 🙂 M-m-m-m-m! Everyone, keep enjoying these many days of Christmas! And Erik, I’m hoping you’ll pass on what festivities are going on there in Poland…and beyond. This year, except for very small token gifts so people could have one or two things to unwrap, my entire family gave each other gifts of donations to charity. Each person picked their favorite charity, and then others made a donation in their name. It was probably the best Christmas we have had in many years — everyone was focused on goodwill to mankind, not getting stuff! 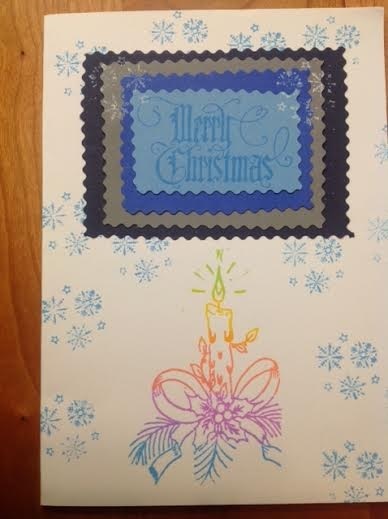 We received a hand made Christmas card from out Amish friends. It was so special. We decided to try making some of our own next year. There are two families on the farm and 7 children (2 preschool). Gifts are a hard thing. Someone mentioned “Farmopoly” (our Amish friends have a farm), but we decided it might be too competitive. On our last visit, I took a canister of Helium (Target & WalMart) and blew up balloons for all the kids. They really seemed to enjoy. Next visit I thought I would try paper airplanes. I found a book with many designs. The secret, I think, is keep it simple. Hope all had a wonderful Christmas and all the best for 2014. Ah, some nice ideas Bob The Quaker. Last summer, on my trips to various Amish ‘bent and dent’ stores, (Salvage) I found different kinds of bubble making devices. I had a left over gallon of bubble solution from years gone by and I took all of these to a meal with some Amish friends. After eating I took the kids outside and we did bubbles for like 45 minutes. Big bubbles, small ones… ones that were produced by a battery operated gadget that made them by the hundreds. It was like it was snowing bubbles. They would chase them and watch them drift up and off. LOL it seemed like everyone was OK with this, I hope I didn’t go to far. I need more ideas of what fun things I can do with their kids when I am invited to visit. Water balloon fights would probably be out where-as a water balloon toss, or egg toss, might be OK? I survived the holidays so time to get back to Amish America, and thanks Tom for the great idea of a bubble machine. I am going to order one for our April trip to Lancaster, PA….battery operated naturally. The kids didn’t pop the balloons….maybe after I left? but they really seemed to enjoy. I tied strings to each & had a metal washer attached so they didn’t float away. I bought one for each of them of the type that holds air for several days so they could have them for a while. I thought it would be disappointing to have them all deflated the next morning. Keep the ideas coming ! ! Last fall when I was out for a Saturday drive in Amish country, I found a farm that was having a “bake sale” in the empty greenhouse. 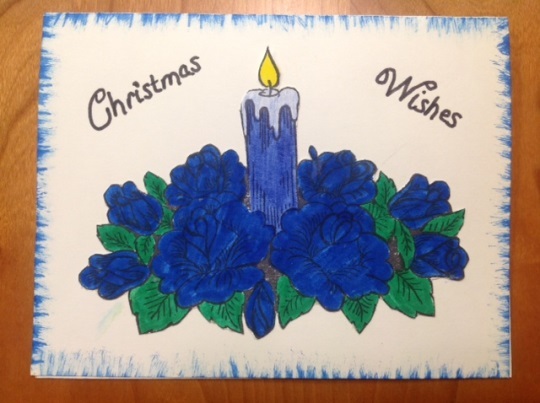 They also had a table with home-made christmas cards. Each was signed on the back by the young girls who made them. They were “three for a dollar” so I picked out 30 which I liked. I found envelopes at Goodwill at “10 for a dollar”. I sent 27 and have three left. These three were not my favorites but pretty none the less. I’ve sent Erik a couple of shots of the front and back. Most everyone who got a card responded postively and seemed to enjoy the cards. Most know of my relationships with the Amish and Old Order Mennonites so they knew what they were. I hope they get posted. What do these Amish women have on their heads?